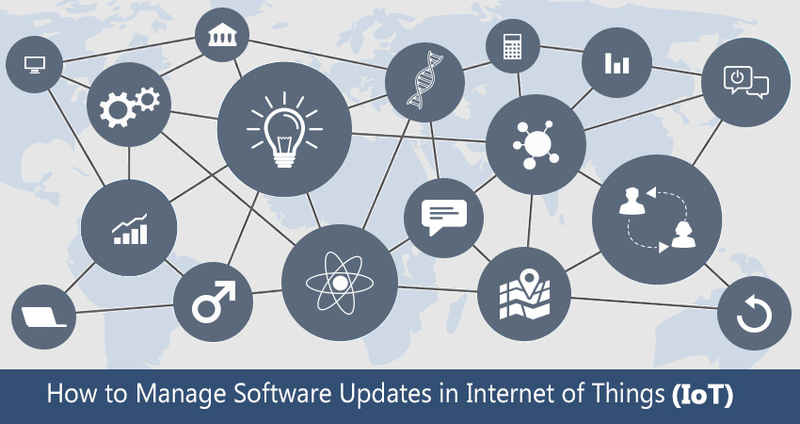 How to Manage Software Updates on Internet of Things (IoT)? Whether you’re a service provider or a manufacturer, IOT product improvements are required to meet market requirements. Along with physical devices, software and applications are also needed in order to keep your software as an ideal business solution. Internet of things (IoT) is a comprehensive solution with outstanding features that seems ideal for any business. But here the question arises that what the significant characteristics are of system updates? What is the Update process in General? While observing the process of system updates from the backend, the software will update quickly because this is an independent operation. Let’s understand it through an example of the sensor system of small business. Sensor updating is a simple process that includes software update delivery to a device that is installed through the complete mechanism. So the process of software updating is all about connecting devices and bunch of files at a single platform. The important thing is updating and managing the solutions in the reliable and secure way at the backend. Here IoT plays a significant role. Software update solution should be open for easy connectivity and this is the most demanding feature. This is the reason direct device integration is offered as an API and a solution. But the problem is, it allows different other protocol adapters to connect through another API named as device management federation. Use of standardized device management protocols and software update process has made things easier. On the other have easy connectivity openness feature also allows to use customized protocols. As IoT is increasing collaboration software, therefore, the updates might have to be performed on different data models. Strongly linked sensors may have single firmware. Entire software update system should be coupled to another internet of things (IoT) platform for an ease. Regular updates help the system in staying flexible and extensible. If the software updates are fully integrated to IoT platform, it is going to increase dependency to the service provider. Dependency on the service provider to complete your process is undoubtedly a risk for an organization. SolutionDots Systems is ensured to lower down the risks with the availability of compatible API solutions. While updating a system, it is asked about the important core features of the reliable system that IoT should have. Here are few core functionalities that are necessary to improve the success rate. The software is a non-tenable asset and devices are tangible therefore this should be the foremost feature. While updating a software in IoT, complete asset management for devices and software is required. It supports by retaining all important device as well as software information. It includes all information related to software, update history, current version, compatibility and how it can access the device. This is the 2nd important feature of a software update. It is dependent on installation, and process or content delivery through different network service providers. Best network service provider ensures the content delivery and global level. This is the significant feature known as the heart of software products. This is the feature that has eliminated the need to update every individual device and software. It offers a managed process and empowers auto-updates at different scales. Software update process includes thousands and millions of devices and it is difficult to take the update responsibility for all connected devices at the same time. Because you have to face different situations and risks. Therefore, it is better to start with a bunch with a small number of devices and complete process easily step by step. This step by step process ensures that if any problem arises, all of the devices will not suffer. Now, this is a thing we can’t skip for any business application update. Deep monitoring and detailed reporting are needed to keep tracking the software update and ensure its security standards. Comprehensive reporting and efficient tracking give outstanding outcomes. How SolutionDots Systems Is Going To Benefit A Business? As we have already shared a variety of aspects that need to be measured during software update through the Internet of things (IoT). SolutionDots Systems understands all security requirements and update standards to ensure effective management and automated control. IoT gateways are utilized to eliminate errors and manual processes. Our smart update tools are offering better management and improve connectivity. In order to get any information, do contact us for professional advice and solutions.